Surrender at 20: [2014 World Championship] Quarterfinals! The 2014 World Championship continues this weekend with the Quarterfinals stage, featuring the remaining eight teams battling it out in the bracket stage live from Busan, South Korea! With the group stages behind us, this weekend features the quarterfinals! 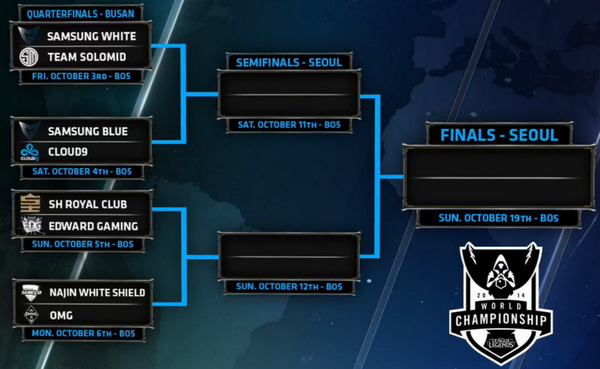 The teams that advanced out of groups as Samsung White and Edward Gaming from Group A, Royal Club and Team Solomid from Group B, Samsung Blue and OMG from Group C, and Najin White Shield and Cloud 9 from Group D. Each team will play their opponents in a best of five match to see who progresses to the semifinals stage next weekend and who gets knocked out of the tournament! The 2014 World Championship will be played on patch 4.14. Following these Quarterfinals, we'll move on to the Semifinals next weekend. The grand finals will be held the following weekend.